The Echo offers print ads that reach a diverse audience. We are in the process of developing advertisements for our website. 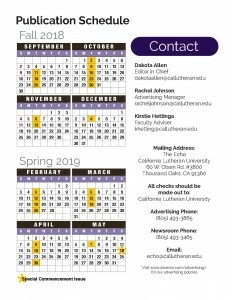 Please contact our business manager Kate Artmann at kartmann@callutheran.edu. Please check out our full Media Kit. You can also order ads online or pay for ads with a credit card at our online store. 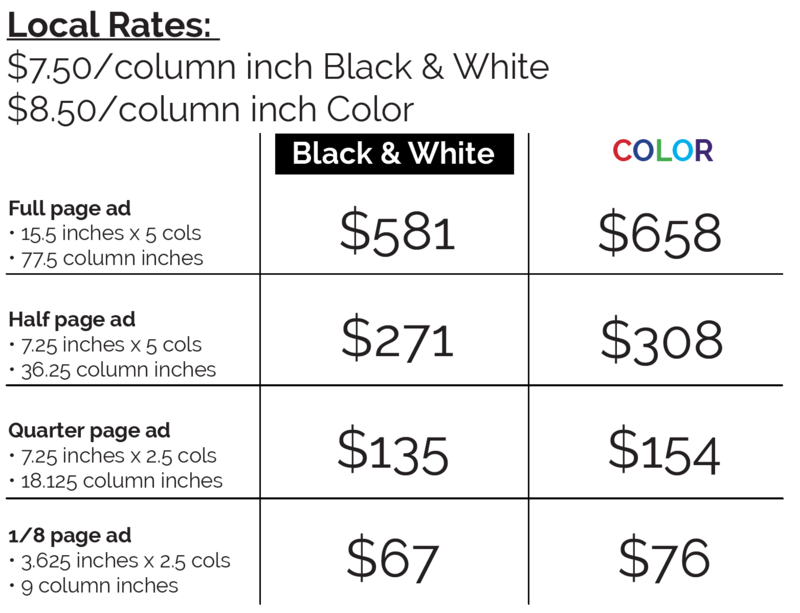 NOTE: Advertisers who request placement on the back page must purchase color ads. Free ads are never guaranteed. 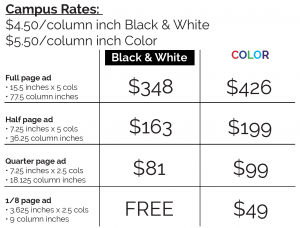 Campus organizations can request 1/8 black and white ads that are only run space permitting, priority is given to news. 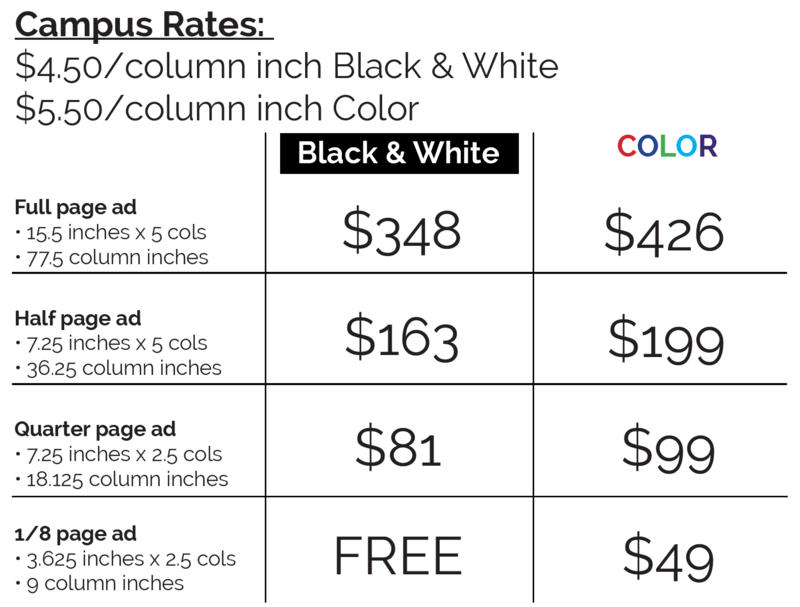 Organizations are limited to one free ad per semester, space permitting. The Echo reserves the right to refuse or revise any advertising deemed to adversely affect the integrity and credibility of the newspaper as a source of truthful and accurate information, or be in conflict with the educational mission of the university community served. 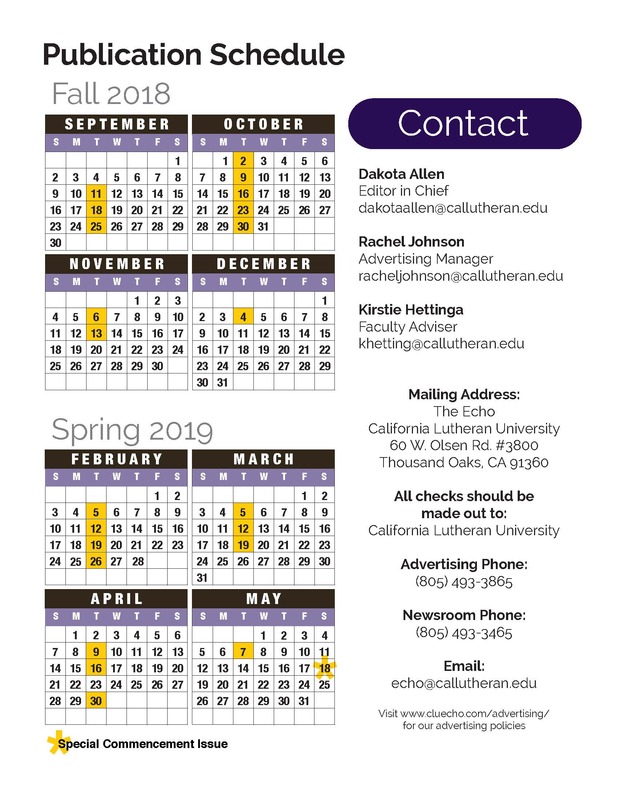 Advertising space in The Echo may be purchased by campus, local and national advertisers. Requests for unpaid publicity space will be considered in terms of probable reader interest, competition from other newsworthy events and the time and space available. That uses a campus address for an off-campus advertisement, where money is to be mailed to the university for forwarding to another agency. When ads may mislead because of ambiguous wording. Ad material must be received no later than the Friday before publication. All financial considerations shall be processed through CLU’s Business Office in accordance with recognized accounting practices. All checks must be made out California Lutheran University. 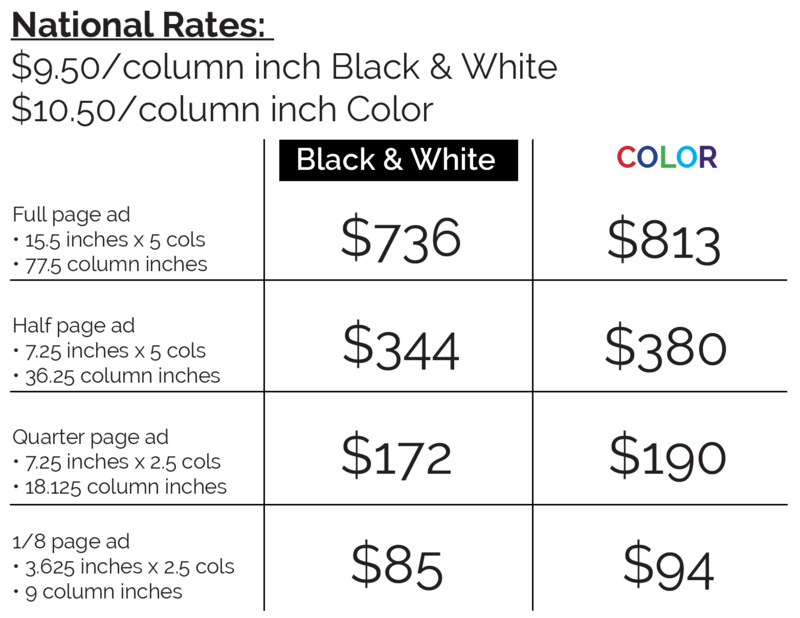 No ads are to be run without either an insertion order (written request) or advance pay. All political advertising must be paid in advance of publication. Political advertisements shall be located in the paper at the discretion of the business manager. However, great care shall be taken that equal exposure is given to all sides. Bills not paid within three months may be submitted to CLU’s Business Office for follow-up action. Further advertising will not be accepted from firms or individuals who do not complete payment. Anonymous advertisers will be discouraged. The copy, art and layout for ads shall be supplied on the same standards of good taste and appropriateness as applied to other material appearing in The Echo. Advertising shall not be run on the front page or opinion pages. Advertisers will not receive special editorial consideration. Political advertising must be labeled “paid advertisement” and must list the sponsoring organization. 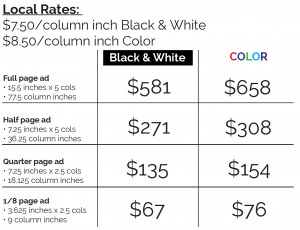 To the extent possible, advertisements shall be rotated so that each advertiser has equal exposure throughout the semester. The spelling in ads must be checked, corrected and rechecked by the business manager before the final deadline. The Echo makes every effort to reproduce advertisements as intended by the advertiser and to a satisfactory quality. Should an ad not be published as ordered (poor reproduction quality, blurred imagery, incorrect ad published) The Echo’s liability is limited to the amount paid for the ad and as such The Echo will run the correct ad free of charge in the next possible issue. Sole responsibility for the content of an ad lies with the advertiser. In the event that the advertiser has provided a poor file, or provided the incorrect advertisement, etc. The Echo is not responsible and the advertiser is responsible for any and all expenses incurred as a result of the publication of such ad. No “make-good” ad will be published. The Echo reserves the right to institute such other general policies as may be deemed appropriate at any time.